About 120 participants from 60 countries took part in a summer school on Integrity by Transparency International that took place in Vilnius/Lithuania from July 4-10, 2016. Over 20 governance and anti-corruption experts delivered lectures on corruption in several sectors such as political corruption and political parties, petty corruption, corruption in sports and the army. The conference also looked at the various types of corruption and the participants came to the conclusion that petty corruption is the one hitting hardest on the poorest. Aside the lectures, there were also sessions for skills training and how to develop projects. Participants were also asked to make brief presentations on how corruption is perceived in their countries. 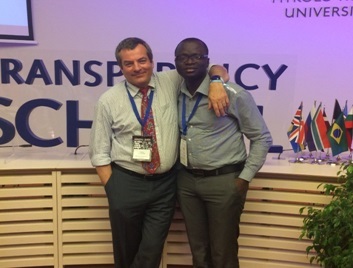 George Akeliwira, who deals with the topic of corruption in his PhD, had the possibility to introduce AGGN as a network seeking to promote best governance practice. He also got the chance to meet the managing director of TI, Cobus de Swardt.